Idaho needs to improve its technology education if it expects to be able to compete in an increasingly sophisticated market, a tech-business wizard said during a discussion at the Community Campus in Hailey last week. 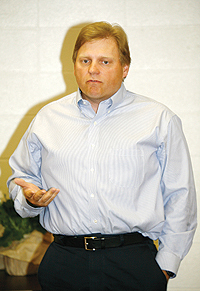 Bob Lokken, an Idaho native and former CEO of Boise-based ProClarity Corp., spoke at the invitation of the Education Foundation of the Blaine County School District in front of 60 parents, teachers, school administrators and interested citizens on Thursday, May 17. The discussion was the first in a planned series of community conversations sponsored by the foundation to map the future of the school district. "Like water is to agriculture, education is to technology," Lokken said. Lokken's discussion focused on the future of innovative technology and how it relates to Idaho's students. He brought a wealth of background knowledge to the discussion. He was at the helm of ProClarity as the company grew 2,600 percent from 1997 to 2002. ProClarity was named to the Inc. 500 of top American companies and to the Deloitte and Touche 500 list for surging sales. He is now senior director of sales and business development for Microsoft in Boise. When he was hired, Microsoft encouraged Lokken to relocate the Boise operation to California because they thought he would have better success attracting workers. Lokken said he would like to continue to expand his operations in Boise but tech-savvy workers can be hard to find in Idaho. "Education is the key to Idaho's growth," Lokken said. "Not only for qualified workers, but for recruiting and attracting families. Many highly educated job prospects don't want to come to Idaho because the education for their children isn't on par with that available in other states." Lokken said innovative technology is at the core of most modern economic success stories and that graduates from Idaho, and from the United States in general, have a long way to go before they are able to compete globally. "On coursework critical to competing in the information age, the United States lags (behind) nearly every industrialized nation, scoring in the bottom twentieth percentile by twelfth grade," Lokken said. Heather Crocker, executive director of the Education Foundation, agreed. "If you research all the communities that are providing their children with an exceptional education, there are two consistent factors—an education foundation and an active community that is focusing resources creatively helping each child reach (his or her) full potential," Crocker stated in a news release. For more information on the foundation's future events, visit the BCSD web site at blaineschools.org or contact Crocker at hcrocker@blaineschools.org.